Home > Events and Exhibits > Sustainability Showcase: Closing Reception and Green Eagle Awards Ceremony. Sustainability Showcase: Closing Reception and Green Eagle Awards Ceremony. 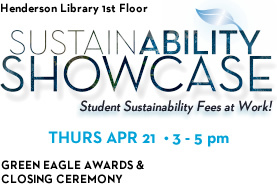 This Thursday, April 21, from 3-5pm, the Sustainability Showcase will have a closing reception at which the winners of this year’s Green Eagle Awards will be announced, as will the recipients of next year’s Sustainability Fee Grants. Last year, Associate Dean Ann Hamilton and Dean Bede Mitchell submitted and received a grant for the library to have Water Bottle Filling Stations installed. They began installation late Fall semester and finished up early Spring semester. To date, the water bottle filling stations have kept 12,467 bottles out of the waste stream! The Sustainability Showcase has some very interesting items on display, and there will surely be good food. So come on down to the 1st floor of the Library this Thursday between 3 and 5pm, and check out what grant recipients have done with their funding. These are Georgia Southern’s Student Sustainability Fees at work!